lionheartuk wrote: It's not the case. These characters are DLC, the content doesn't exist in the original game, its downloaded and installed onto the console after purchase. I don't understand whats nonsense about this. There are around 10 or more people using this tool to find all the meshes in this game, not to mention the countless others online. Nobody has come across the files that are from DLC's, either stages, textures, characters,rigs or animations, in all of that time. Thats because the files aren't in the original game disk, I don't understand how anyone can take issue with this, its not negotiable, its exactly how DLC works. Its true that there have been some games that use DLC to simply 'unlock' files that're already in the base game, but this game isn't one of those cases. The characters that are missing are not DLC though, that's the thing. I've searched for characters and bosses that are only in the main game and found two, nothing else. First of all, thank you very much for these tools Daemon1!!! Not sure what I'm doing wrong if anyone has a clue I'd appreciate it but well I will keep trying in the meantime! They may look random but I think is the file name encrypted; I think DOA5 used a similar form of file name "encryption"
hello, i wonder if it is possible to expand the support for Dead or Alive 6? 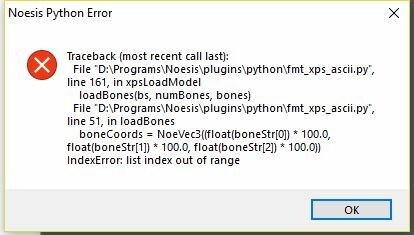 This tool works for some models which got a simple armature (simple outfits, faces, hairs with simple bone structure), but for those with too much bones it just give the error "list index out of range" on the converted ascii. Why it doesn't surprise me they're trying to extract the PC version already? Who's begging in there tho? There is no "private circle share" and there are also no tools. I am the one that posted Yuna and they are dumps from the ram, the files themselves are encrypted.